For those who are vegan or want to try vegan and find out more about this lifestyle, then a Vegan Food & Living magazine subscription is what you need. With over 75+ recipes inside every issue, this is the perfect magazine to take your culinary skills to the next level. Full of articles and features on how to go vegan, from accidentally vegan products to expert nutrition guides, Vegan Food & Living helps you understand veganism perfectly. 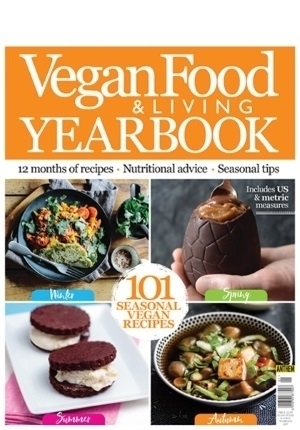 Celebrating the vegan lifestyle, Vegan Food & Living is a bestselling and multi-award winning magazine. Why not treat yourself or a vegan friend to a Vegan Food & Living magazine subscription? It’s the gift that keeps on giving all year round! Please note that this title is not available in Australia or New Zealand. Needing some inspiration on what food to cook up next? Or just some extra tips and advice on how you can maintain your vegan lifestyle? Then pick up a Vegan Food & Living magazine subscription. Full of recipes for everyone, from quick and easy dishes to weekend banquets, and even how to make your own mock meat and nut butters. If you are curious on what brands are ethical and vegan or just wanting to know more about your favourite vegan celebrities, you’ll find it all in Vegan Food & Living magazine. Are you new to the vegan lifestyle? Packed with helpful guides to introduce you to the different ways you can eat vegan and how to fill your cupboards with tasty treats and snacks that you’ll be shocked are vegan. Even if you are just wanting to swap a couple meals out a week to live a bit more consciously then you’ll find all the inspiration with a Vegan Food & Living magazine subscription. How much is Vegan Food & Living magazine? How often is Vegan Food & Living magazine published? How can I buy Vegan Food & Living magazine? How many issues of Vegan Food & Living magazine are published each year? Who publishes Vegan Food & Living magazine?